This is likely old news to everyone, but I stumbled upon a most enchanting transgender movie by director/screenwriter Eric Schaefer. 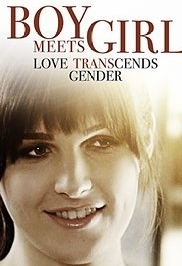 "Boy Meets Girl" is a 2014 US movie that is a real life and funny romantic comedy. It explores all aspects of being transgender in a positive light. It sugar coats nothing but leave you seeing that "Love Transcends Gender" as the tile suggest. A most sensitive and accomplished film depicting the struggles of a twenty something transgender girl dealing with identity and romantic issues, Boy Meets Girl is a funny and touching comedy/drama boasting a superlative debut performance by Michelle Hendley. Hendley, who is transgender in real life, plays Ricky, who dreams of escaping her mundane existence working at a small coffee shop in rural Kentucky. Her aspirations to attend fashion school in New York City are encouraged by her longtime best friend Robby (Michael Welch), who clearly has no problems with her sexuality. Ricky's life takes a dramatic turn when she meets Francesca (Alexandra Turshen), the sort of refined debutante who uses the expression "Charmed, I'm sure" upon being introduced to someone. Despite being engaged to a Marine serving in Afghanistan, Francesca finds herself attracted to Ricky, and the two begin a relationship. I will leave the review there, but you can read the complete narrative from the above link. It is one of the best and most direct transgender movie I have see to date. It is funny, touching and make we wish, well, many things. You will fall in love with Ricky, Michelle Hendley, and her story is worthy of another post soon. A new actor that was chosen for her YouTube presence. I received it as a Netflix suggestion and believe it can be seen (viewed at a reasonable cost) on YouTube. It is so worth it. I will likely purchase it for my, see often list. "Boy Meets Girl" explores what it means to be a real man or woman, and how important it is to live a courageous life not letting fear stand in the way of going after your dreams. Hi Rhonda, I love your blog and I really loved this movie too. I've probably watched it a half dozen times since I came across it on Netflix a couple of months ago. I recommend: "My Transgender Summer Camp" which is on YouTube. Although I'm way past the age of those kids I find myself living vicariously through their experiences and it deeply touches me. My favorite trans movie is Soldier's Girl. I remember when it was made and advertised for HBO. I stayed up late that night so no one (my wife) would catch me watching it. That movie moved and haunted me, Lee Pace did an amazing job in my opinion of playing this part. Up until that movie the only trans characters I had ever seen in TV or movies were prostitutes or paradies.